I have been a Cycling fan for a long time. Got into it at University a long time ago through some crazy friends that were already into it. And I have been on the bike ever since. 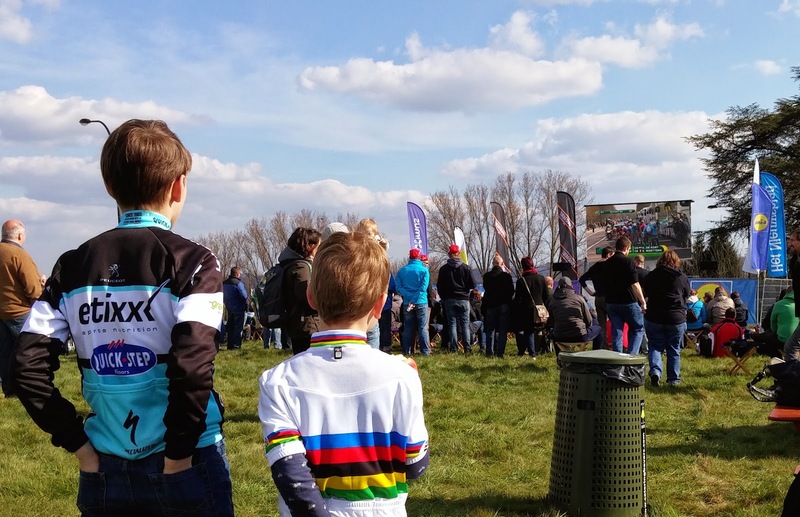 Whether it's just for some grocery shopping and/or bar hopping in Antwerp, or for a longer holiday trip - or just for watching the pro riders in CycloCross or Road racing - I am game for all of it. I even got my boys really excited about - watching legendary races like the Tour of Flanders or Paris-Roubaix together religiously. So last March, I was thinking of yet another crazy Neo4j-experiment to do, and I thought about doing that on some cycling topics. After all, April is a "Holy Month" for cycling enthousiasts - many of the legendary "classic races" are happening during that month. So that's what I did. I will be detailing this over the next couple of blogposts - but suffice to say that I got into a bit of a project here, a journey that I gladly want to share with you. So here it goes. This is part 1 of (what I think will be) 5 blogposts around Neo4j, graph databases, Twitter and Cycling. Hoping you will enjoy it. 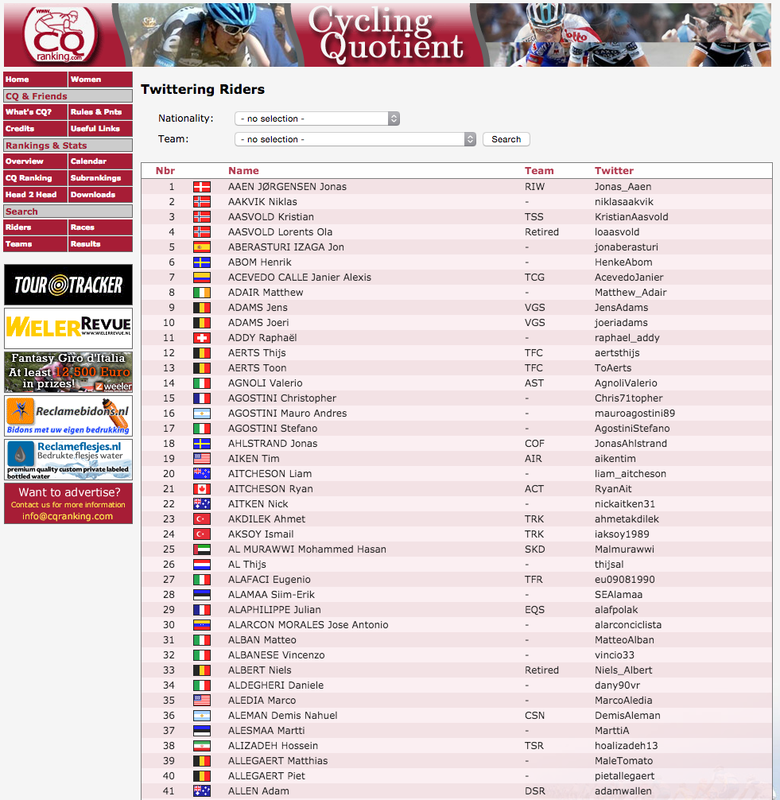 The obvious idea I had was to try and do some work with some social networking data for the top riders in the pro cycling peloton. 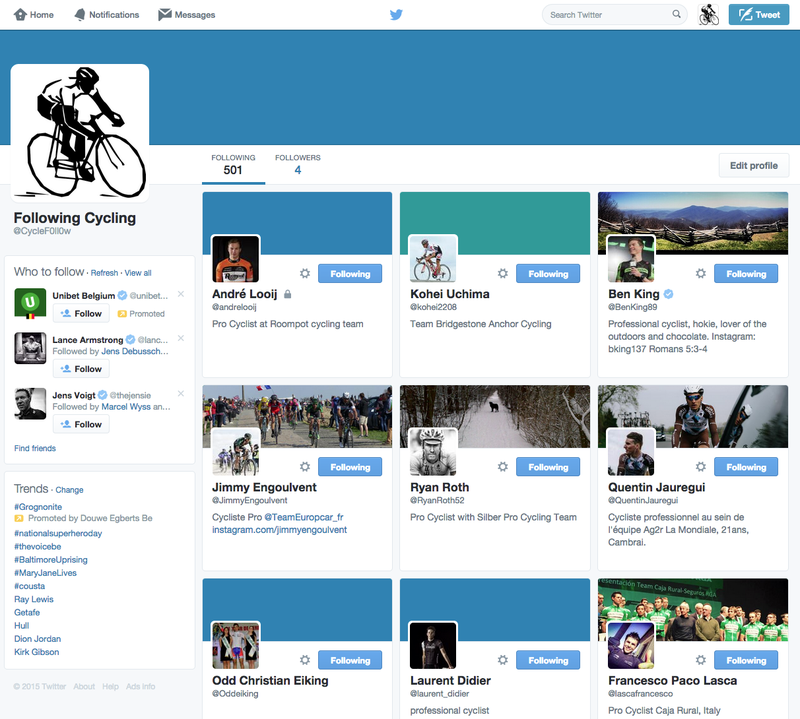 I follow some of these guys myself on my Twitter feed, but how would I be able to get to all the interesting ones like Tom Boonen, Fabian Cancellara, and others. 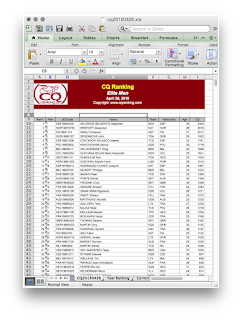 I googled around a bit and found this site: CQ Ranking. In their own words: they are a ranking of Pro cycling riders that try to rank riders based on the past 12 performance - a bit like the UCI ranking of cyclists. 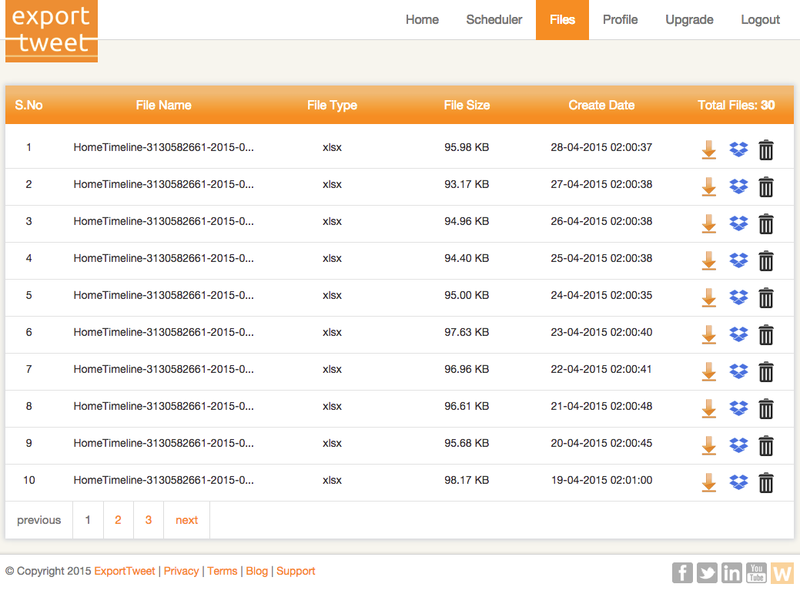 And they provide some really cool data: here's an example of a sheet that you can download from their website. One of the most interesting data elements that I found on the CQ website was the list of Twittering riders. This was almost exactly what I was looking for for my experiment, a long list of all the riders, their teams, their countries... and their twitter handles. Obviously there were going to be some mistakes/problems in this list, but still - it looked pretty sweet. So there I went, downloading everything and putting it all into a google spreadsheet for some data cleanup so that I could prepare it for an upload into Neo4j. This turned out to be a bit more difficult than I thought it would be. Sure, Twitter gives you this API access to read from their vast datasets, but frankly, for a newbie like me these "rate limiting" rules are pretty confusing and intransparant. And plus - I don't really know how to code :) - so that really limited my options. 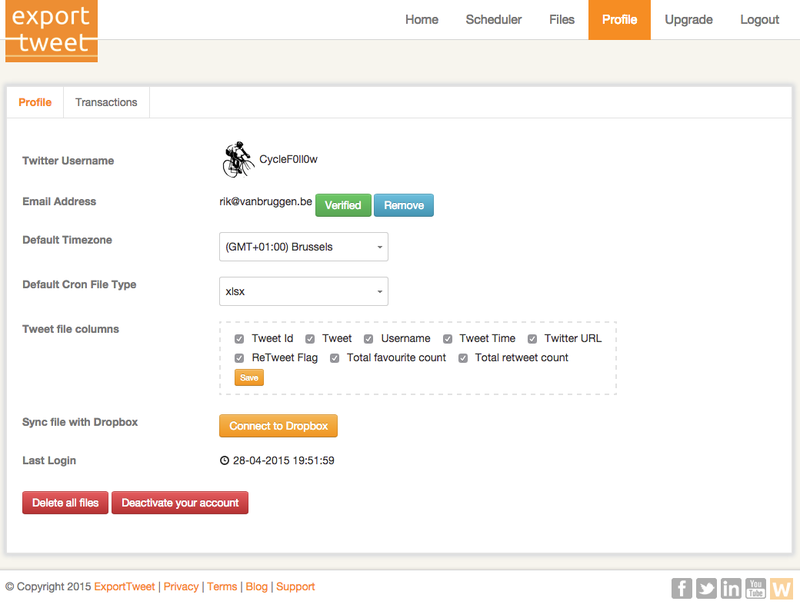 So I tried a few things and then decided that the easiest way to get to all of these "April tweets" would be to create a new twitter account (CycleF0ll0w) and then follow all of the accounts that I wanted to follow (from the spreadsheet). So that's what I did: a ghost twitter ID appeared: all it does is follow people - so that I have access to the timeline that contains the information I want. 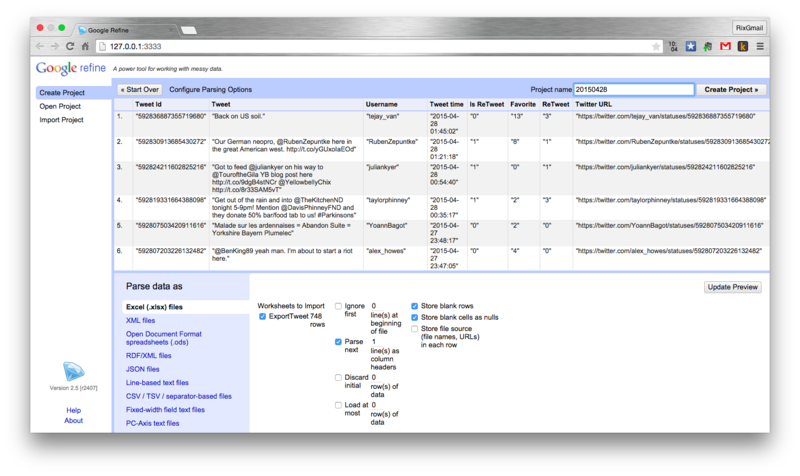 In order to easily create the list of people that "I" followed, I used a tool called Tweepi: it allows for bulk creation of "follow" links really easily. 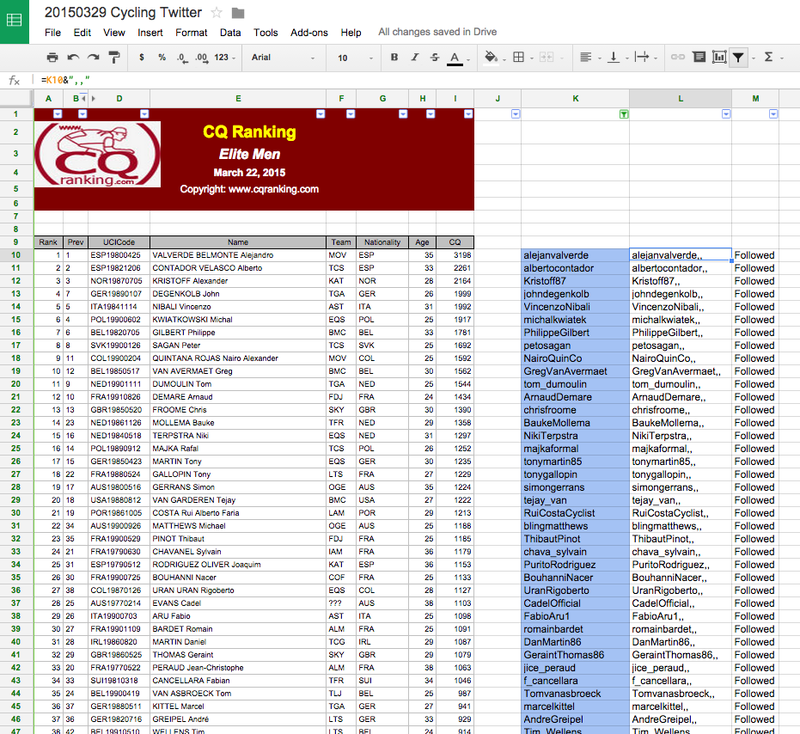 I decided to go with the top 500 (as per their CQ ranking) riders - that should be more than interesting enough. So now I have a timeline. 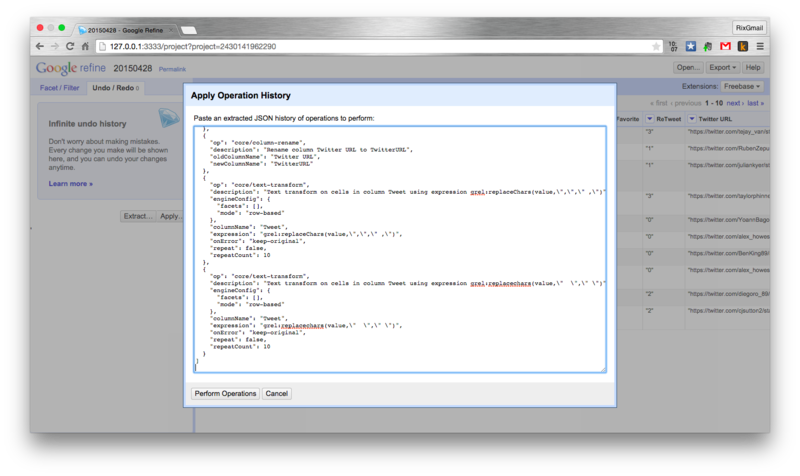 How do I get that to be extracted so that I can work with it and get it ready to be imported into Neo4j? Again, I investigated multiple options, but ended up going for a paid service: Exporttweet. On a daily basis, this service automatically created an Excel spreadsheet containing all the tweets appearing on my CycleF0ll0w timeline. The output was really simple: an Excel file a day, keeps the doctor away! an OpenRefine process to create CSV files out of these tweets on a daily basis. In the next blog post I will go and get started with this - and start having some fun with the data. Hope you enjoyed this so far - already looking forward to part 2. As always, feedback welcome.